Last week we mentioned that Asheville is ready for the holidays. The holiday season officially kicks off here the week before Thanksgiving, which is this week. Decorations are up and the holiday spirit is in the air. 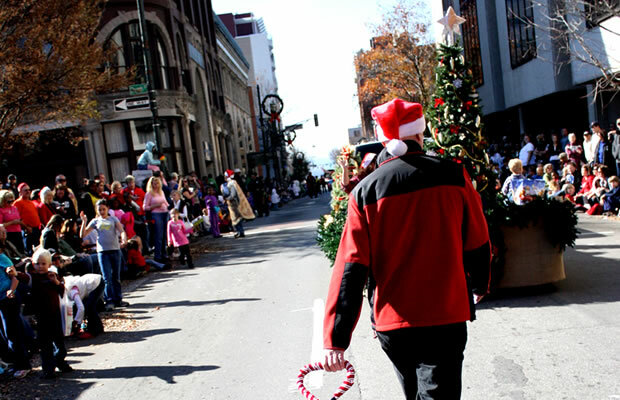 To add to the holiday excitement, The Asheville Holiday Parade and Jinglefest happen this weekend on Saturday, November 23 starting at 11a.m. The Asheville Holiday Parade starts on Biltmore Avenue, makes a left on Patton Avenue, then ends at French Broad Avenue. This year's parade is the largest thus far with 101 entries with the theme "A Star is Born". The Parade Grand Marshals are some of Asheville’s most talented stars including Ann Dunn and several Nutcracker dancers of The Asheville Ballet, Josh and Sue from 98.1 The River, Tammy Jones from Mix 96.5, star baritone Dominic Aquilino and soprano Kelli Mullinix of Asheville Lyric Opera, and young actors from "The Best Christmas Pageant” at Asheville Community Theatre. The Grand Marshal float is sponsored by Deerfield Episcopal Retirement Community.You can find a full list of parade participants here as well as the parade lineup here. New to this year's celebration are giant balloons that soar above the parade, along with eight marching bands, a variety of dance and cheer groups, dueling pianos, a skip rope team, llamas, horses and unicycles to entertain the crowd. All leading up to the big finish, Santa Claus, sponsored by The Grove Arcade. Two of the big helium balloons in the parade, the Happy Stars, are handled by volunteers from Toys for Tots with active Marines in dress uniform marching alongside. This serves as a reminder to everyone to bring their donations of unwrapped toys to the Toys for Tots donation area at JingleFest. After the parade, the holiday fun continues at Pack Square Park with JingleFest from 1-4p.m. The free family fun includes a non-stop stage show emceed by actor and comedian Tom Chalmers. The show kicks off with a concert by Trinity Baptist Jubiliee Choir at 1pm and a special holiday concert by the Asheville Choral Society at 3pm. Kids can play on giant inflatables while waiting for Santa, who should arrive about 2p.m. Photographer Steve Barker is on hand to snap digital photos of children with Santa for free. Games and giveaways are offered by various sponsors. Food vendors are at the JingleFest offering some of your favorite festival fare including funnel cakes, hot chocolate, and a Bojangles food truck. Don't let the fun end. Make your Saturday complete by heading over to The Grove Arcade for more holiday festivities. If you happen to miss Santa on parade day, he will be at The Grove Arcade every Saturday in December until Christmas. Beginning December 5, a walking tour of downtown's decorated windows will be available for download. The winners from the Downtown Holiday Windows Contest will be selected by then and will stay decorated until the end of the year. Take the Holiday Decorated Windows Walking Tour and see it for yourself! There is so much to see and do during the holiday season in Asheville. It's a unique experience all its own. We hope you're making plans to spend your holidays in Asheville. If so, make the most of your visit by staying locally in a downtown Asheville vacation rental or tucked away in a mountain cabin outside the city limits. Let us know if we'll see you during the holidays. We'd love to hear from you!